"Mr. Murthy is a Yale-trained physician, an instructor at Boston’s prestigious Brigham and Women’s Hospital and a health technology entrepreneur. As Mr. Obama’s nominee for surgeon general, it’s also no shock that he supports a variety of the president’s policies, including on gun control. Among his sins, the NRA explained in a letter to Senate leaders, is past support for meek gun regulations such as licensing and waiting periods. He also once dared to claim that “guns are a health care issue,” a fact that any doctor with experience in the emergency room knows well. 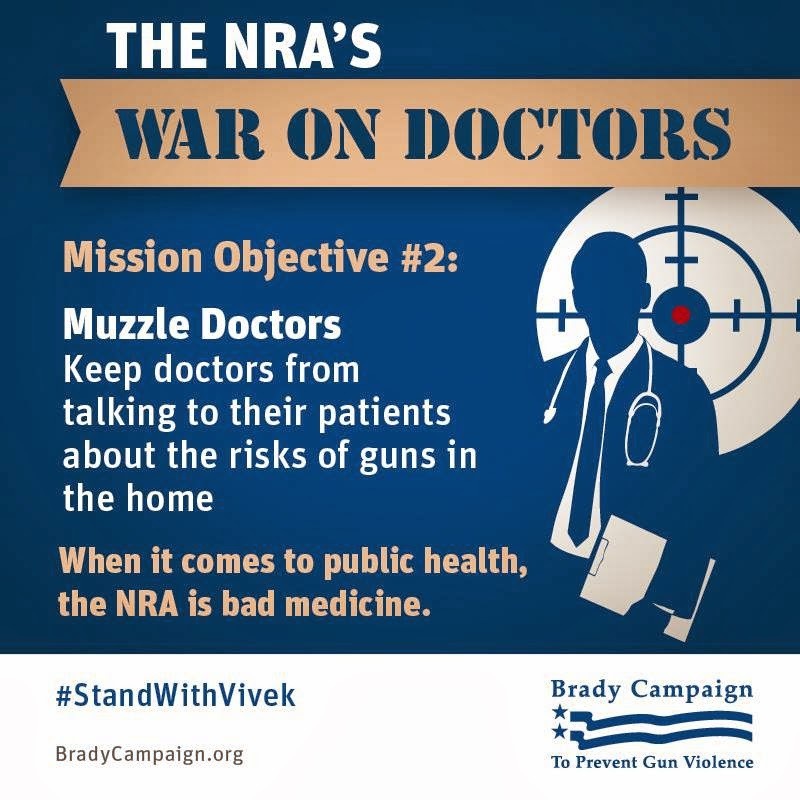 Mr. Murthy, the NRA fumed, would remove the ban on physicians asking patients whether they keep guns in the home and lift restrictions on gun death research at the Centers for Disease Control and Prevention (CDC). All of those ideas sound pretty modest to us. Even if they weren’t, they don’t provide any pretext to oppose Mr. Murthy’s confirmation, since he would not be in a position to set firearms policy as surgeon general. The fact that he’s right just makes the insult worse." Doctors have been asking patients questions about their health and safety for decades and more. That's what they do. Why? Because it's their job. But now the NRA lobbyists and leaders have decided they know more about this than the health care providers. Such arrogance and bullying should alarm us all. But that doesn't stop a group of people, a minority of Americans at that, from trying to stop common sense discussions about the causes and effects of gun violence. They don't want American citizens to know the truth of the matter. Americans are killed in large numbers by unsecured guns in homes. Children most especially. If you read this blog, you know how often I write about incidents of children finding loaded guns in their homes and shooting someone- sometimes themselves. You can read about yet another one, below. This is irresponsible gun ownership. Perhaps if some of these parents had received and heeded advice from their pediatrician or family doctor, they would think twice about how to secure their guns. The report highlighted the deleterious health consequences of tobacco use. Smoking and Health: Report of the Advisory Committee to the Surgeon General held cigarette smoking responsible for a 70 percent increase in the mortality rate of smokers over non-smokers. The report estimated that average smokers had a nine- to ten-fold risk of developing lung cancer compared to non-smokers: heavy smokers had at least a twenty-fold risk. The risk rose with the duration of smoking and diminished with the cessation of smoking. The report also named smoking as the most important cause of chronic bronchitis and pointed to a correlation between smoking and emphysema, and smoking and coronary heart disease. It noted that smoking during pregnancy reduced the average weight of newborns. On one issue the committee hedged: nicotine addiction. It insisted that the "tobacco habit should be characterized as an habituation rather than an addiction," in part because the addictive properties of nicotine were not yet fully understood, in part because of differences over the meaning of addiction. The 1964 report on smoking and health had an impact on public attitudes and policy. A Gallup Survey conducted in 1958 found that only 44 percent of Americans believed smoking caused cancer, while 78 percent believed so by 1968. In the course of a decade, it had become common knowledge that smoking damaged health, and mounting evidence of health risks gave Terry's 1964 report public resonance. Yet, while the report proclaimed that "cigarette smoking is a health hazard of sufficient importance in the United States to warrant appropriate remedial action," it remained silent on concrete remedies. That challenge fell to politicians. In 1965, Congress required all cigarette packages distributed in the United States to carry a health warning, and since 1970 this warning is made in the name of the Surgeon General. In 1969, cigarette advertising on television and radio was banned, effective September 1970. It was the responsible and right thing to do. Congress rose to the challenge in the name of public health and saving lives. Is there something wrong with that? Our current Congress could do the same and we need to demand that they do. 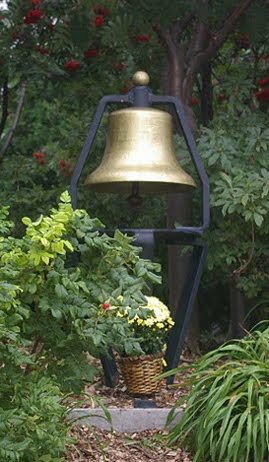 A sensible safe-storage measure sponsored by state Rep. Bill Patmon, a Cleveland Democrat, still sits in committee, where it has languished for more than a year. House Bill 31 would prohibit gun owners from leaving a firearm around the house that isn’t safely stored or locked by a safety device, if they have reason to believe a minor could get hold of it. More than half the states have similar laws. So should Ohio. Such laws have reduced accidental shootings of children by as much as 23 percent, the Children’s Defense Fund of Ohio says. It studied eight states with child access prevention laws and found that between 1999 and 2006, they had less than half the average death rate for accidental shootings among children. Saving lives is a good reason for this simple law, despite the nonsense espoused by gun-rights advocates that it would unduly delay a shooter’s access to his or her weapon. It’s clear this law would have saved dozens of lives. By contrast, there is no evidence in Ohio that taking extra seconds to gain access to a gun in the house has caused anyone’s death or injury, especially with touch-access safes and readily available trigger locks. National studies have shown what we all know: Many young people live in homes where they have unfettered access to guns. In Ohio, the Department of Youth Services in 2012 reported 229 juveniles in its custody with firearms involved in a criminal offense. According to Hutchinson County State’s Attorney Glenn Roth, the 9-year-old was interviewed by investigators with the South Dakota Division of Criminal Investigation after the shooting. Roth said the 9-year-old told investigators that he and his 7-year-old brother were playing with a handgun when he pulled the trigger, thinking the gun was not loaded, and unintentionally shot the 7-year-old. The 7 year old died of the gunshot injuries. Senseless and avoidable. There's a lot more in this article of interest that reveals the true agenda of the gun industry and gun lobbyists in this "debate." It should alarm Americans to find out that important public health decisions are being made by a powerful industry lobbying group rather than by the people who practice health care. This is not who we should be. We are better than this. So if you're with me, please let your Senators know that voting against Dr. Vivek Murthy is not OK. Common sense needs to prevail if we truly care about our public health and safety epidemic. It's time for a change. Let's get to work. You can take action and not just read about the problem. This petition already has over 88,000 signatures. That shows that the public does not like the agenda of the NRA. Please sign it. Thank you.